McDrury, J., and Alterio, M. G.
(This book is now with RoutledgeFalmer Ltd, UK and USA). Stories often need to be told in different forms before they feel’ complete and learning can be consolidated. As tellers and listeners we consciously and subconsciously draw on our past experiences to make sense of current situations. 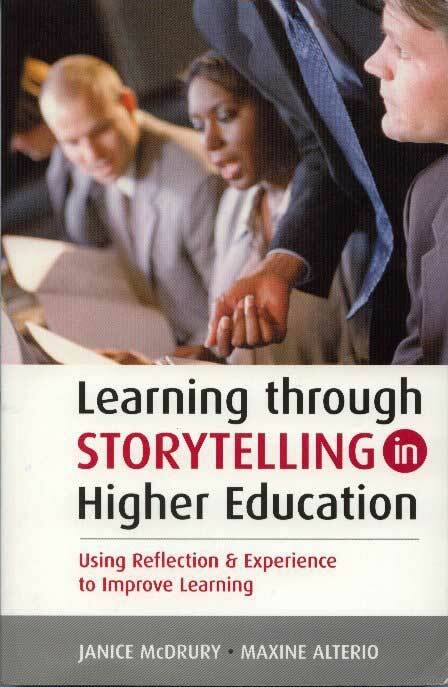 Learning through Storytelling in Higher Education, co-authored with Janice McDrury, has attracted international attention and has been cited by educators, health practitioners and other professionals from various disciplines and countries. Drawing on a wealth of experience, the authors explain how storytelling has the capacity to support educators, learners and others to reflect on and learn from experience and, in the process, deepen their understanding of practice and self. They also demonstrate how formalised storytelling processes, which accommodate diverse cultural and emotional realities, can be used to inform, develop and advance professional practice by linking the art of storytelling with reflective learning processes. This book is a rigorous academic study of storytelling as a learning tool, yet it is written in an accessible and practical style, which clearly illustrates how theory will impact on day-to-day practice. It will be valuable for educators teaching in higher and further education, students, practitioners and professional developers, as well as educational and health researchers. Janice McDrury and Maxine Alterio have woven together artfully the traditions of storytelling and reflective learning. Through the authentic voice of the authors’ own experiences, readers will find a wealth of ideas for students and professionals seeking to give stories and storytelling an honoured place in their learning and practice within educational and clinical settings. Professor Carol Witherell, Lewis Clark College, Portland, Oregon, USA, (endorsement on back cover of book). The book argues that through storytelling, students can learn how to make visible what has been tacit in their work based practice. They [the authors] show how an inward journey through memory can lead to new discoveries and re-discoveries which lead to a re-framing of experience and ultimately a redesigning of practice. Jenny Willan, reviewed for the Higher Education Academy, Subject Centre of Education ESCalate, United Kingdom. Anyone interested in good teaching practice – above all anyone engaged in that complex assembling of material into meaningful shape which is teaching creative writing – should find this book inspiring. Fiona Sampson, reviewed in Writing in Education for the National Association of Writers in Education, United Kingdom. The schemata offered by McDrury and Alterio offer a personal approach that situates students within their cultural and experiential context. The inclusion of a chapter on ethics and assessment is particularly welcome. The discussion regarding the choice of appropriate exemplars in relation to the task to be achieved, the necessity of demonstrating the learning that has occurred and identifying the relevance of theory, and the evolution of practice, are exactly where the focus needs to be. Dr Valerie Clifford, reviewed in International Journal for Academic Development, Vol 10, No. 1, May, 2005.